Cooking fresh scallops is so simple that most people overthink it and end up overcooking the delicate mollusks. Preparing scallops properly is a matter of timing as much as it is of seasoning and cooking method. Scallop flesh starts out tender and toughens as it cooks, so it is crucial to cook them just until they are done. Many recipes call for breading or cream sauces, but scallops are naturally low in fat, so the more simply you cook raw scallops, the healthier they are. Baking scallops does not cook them as quickly as pan-frying or broiling, but it makes for a more tender dish without a discernable outer crust. The trick to baking scallops without drying them involves three steps. Cook them at high heat, moisten them and don’t cook them for too long. Making sure they are healthy is the easiest part. Simply don’t add anything that contains large amounts of fat, sugar or salt. A 450 F oven, a sprinkle of lemon juice and pepper and 10 minutes is all you need for scrumptious baked scallops. Quick cooking under intense heat brings out the delicate crispness of scallops in just a few minutes. 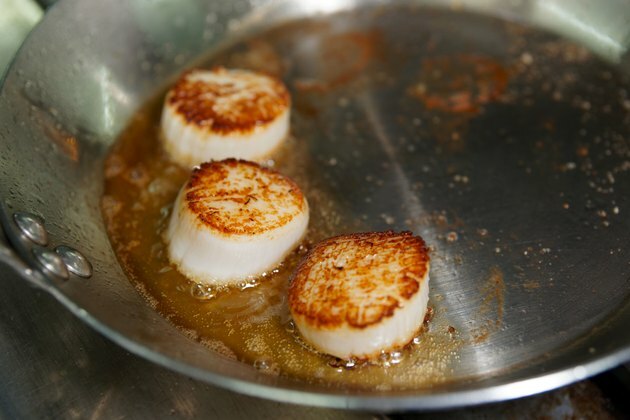 Brush your scallops with olive oil to keep them from browning too fast or from drying out. This adds trace amounts of fat, but olive oil is very high in omega-3 fatty acids, which help regulate your cholesterol levels. Broil your scallops for no more than 5 minutes, flip them, and broil them for another minute. Pan-frying scallops sears the outsides and lets the insides heat to creamy perfection. Heat the pan first, and add olive oil and a little garlic for flavor. Put the scallops in all at once. They cook so quickly that if you add them one at a time, the first ones will be done before you’re finished placing them all in the pan. Two to 3 minutes on a side is all they need. They are done when they are opaque all the way through when sliced with a fork. Scallops do well on the grill as long as you can keep them from slipping through the rack. Slide your scallops onto skewers, poking them from side to side, rather than top to bottom. Brace them with cut-up vegetables or use two parallel skewers to keep the scallops from flapping around when you turn them over. Two to 3 minutes per side on a greased, medium–high grill is all you need.